What does it take to be among the most successful World leaders? That’s a question that’s the basis of a seemingly endless supply of books and seminars around the world as people try to find out what they need to do to be a better business leader. The result of all of these different opinions and recommendations is that it’s impossible to find a simple answer, so sometimes you need to drill down to find a more straightforward question and answer. One way to do this is to look at the actual leaders of the world and see what helped them to get where they are today, so that is what SavingSpot has done. 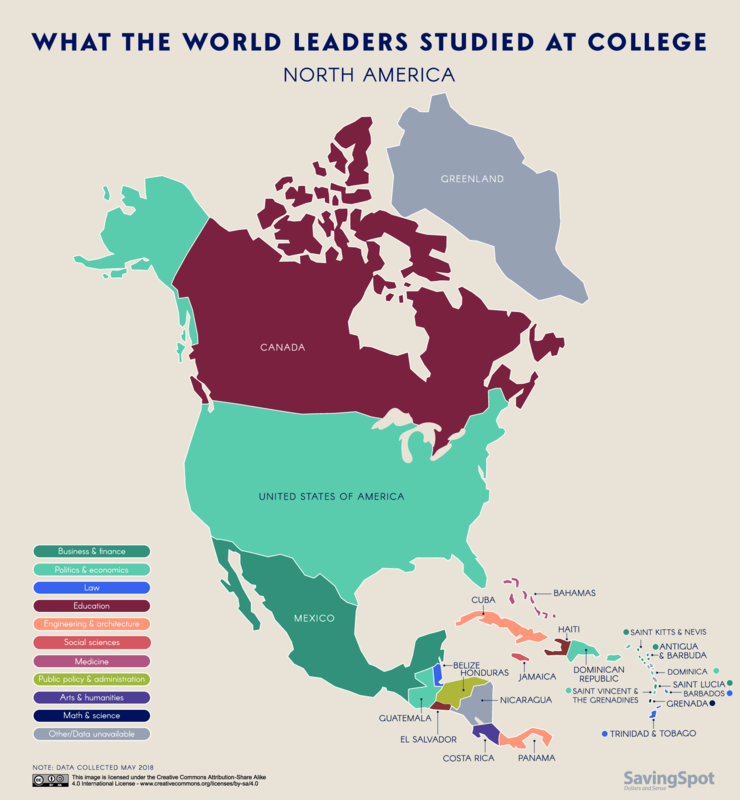 They have researched what college courses all of the presidents and prime ministers from around the world studied on their path to power, and the results are interesting and informative. 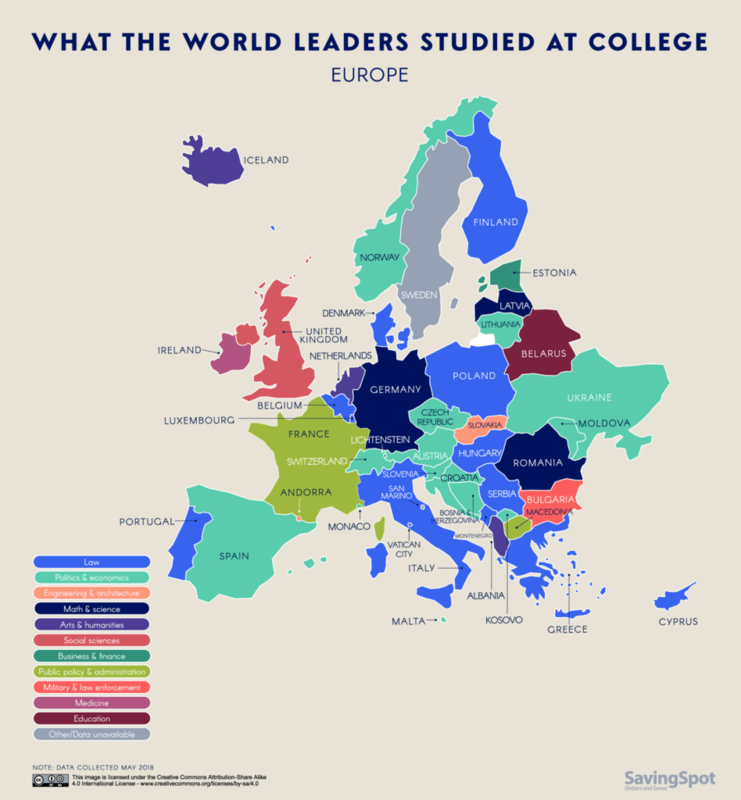 Your college education tends to play a big role in the career you have - or at least that’s the theory - so collating which courses produced the most global leaders is a good way of getting an understanding of what it takes to be a leader. Which courses produced the most top politicians? Which leaders got to where they are by more unconventional paths? 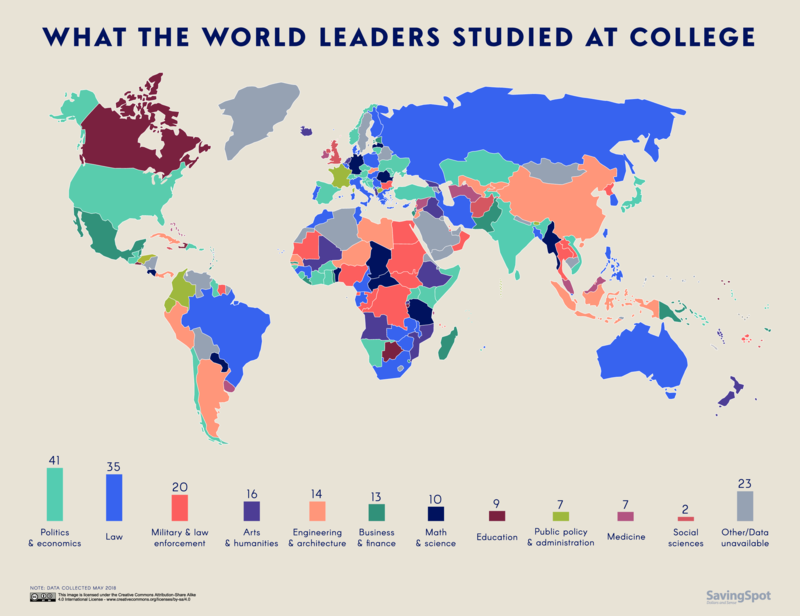 The least surprising revelation from the research is that the most popular subjects studied by world leaders in their college days were in the field of politics and economics, the two areas you most need to understand to be the most powerful person in a country. Donald Trump, for example, studied economics at the Wharton School of the University Of Pennsylvania, graduating with a bachelor’s degree, which presumably set him up for a career in real estate, reality TV and, indeed, the Presidency of the United States of America. Other leaders with this kind of college background include Japan’s Shinzo Abe and Narenda Modi of India. The second most popular course for world leaders was law, which is also not surprising and certainly reassuring as a good understanding of laws is helpful when your job is to make them. Vladimir Putin studied law at Leningrad State University on his path to power in Russia, while Malcolm Turnbull of Australia studied both law and the arts at the University of Sydney. Amongst the world leaders to have studied military and law enforcement courses at college - unsurprisingly - is Kim Jong-Un of North Korea, who went to Kim Il-Sung Military University, which was named after his grandfather. 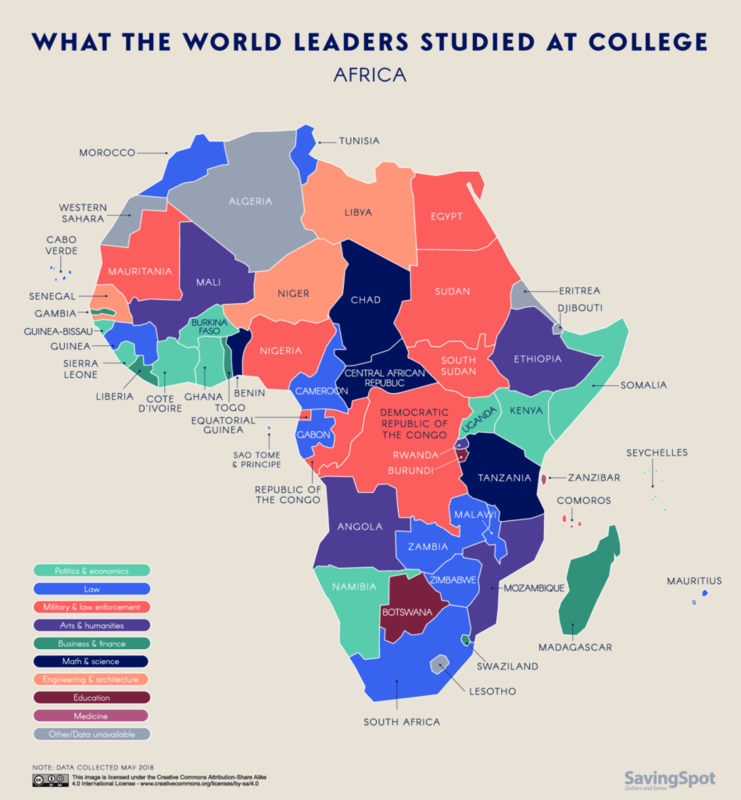 There’s plenty of alumni of these courses in Africa, where the leaders of countries like Egypt, the Democratic Republic of Congo and Sudan all have a background in military education. It takes more than just an understanding of military strategies, economics, law and politics to be a world leader, of course, and there are plenty more subjects that played a part in building the leaders of the modern world. For example, UK Prime Minister Theresa May studied social sciences, one of only two world leaders to do so, along with Ashraf Ghani of Afghanistan, while seven studied medicine, including Mathahir Mohamed, Prime Minister of Malaysia. Angela Merkel of Germany studied physics at Karl Marx University, going on to be awarded a doctorate for a thesis on quantum chemistry, while French President Emmanuel Macron was a philosophy student at Nanterre University. Justin Trudeau of Canada studied English and then Education in his college days (as well as starting but not finishing an M.A. in environmental geography) while Jacinda Ardern, Primer Minister of New Zealand did a Communication Studies degree before going on to become her country’s youngest leader in 150 years. Some world leaders showed no signs at college of wanting to reach the political heights they’ve since achieved. 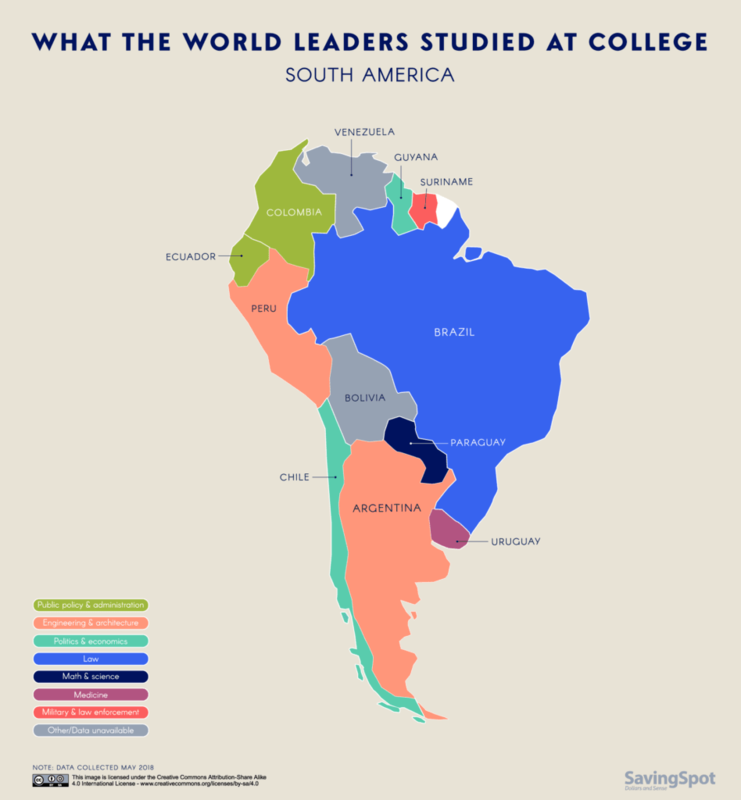 Paraguayan president Horacio Cartes has a post-graduate degree in aviation, perhaps a decision inspired by his father owning a Cessna franchise, while Salvador Sanchez Ceren of El Salvador trained to be a teacher and even worked as one for ten years before setting his sights on something more grand. Cuban President Miguel Díaz-Canel holds a bachelor’s in electrical engineering, while Swedish Prime Minister Stefan Löfven studied social work before becoming a welder, a career that led to the world of politics after he became involved with unions. Sooronbai Jeenbekov of Kyrgyzstan, meanwhile, studied zoological engineering, while Xi Jinping’s preparation for being the leader of over a billion Chinese people was studying chemical engineering. If you’ve ever been on the receiving end of a tough physical education teacher, spare a thought for the people of Burundi, where their leader Pierre Nkurunziza has a bachelor’s degree in the subject. Elsewhere in Africa, Ali Mohamed Shein, President of Zanzibar earned a PhD in clinical biochemistry and metabolic medicine when he was at college. However, a college education isn’t necessarily an essential qualification for becoming a political leader. 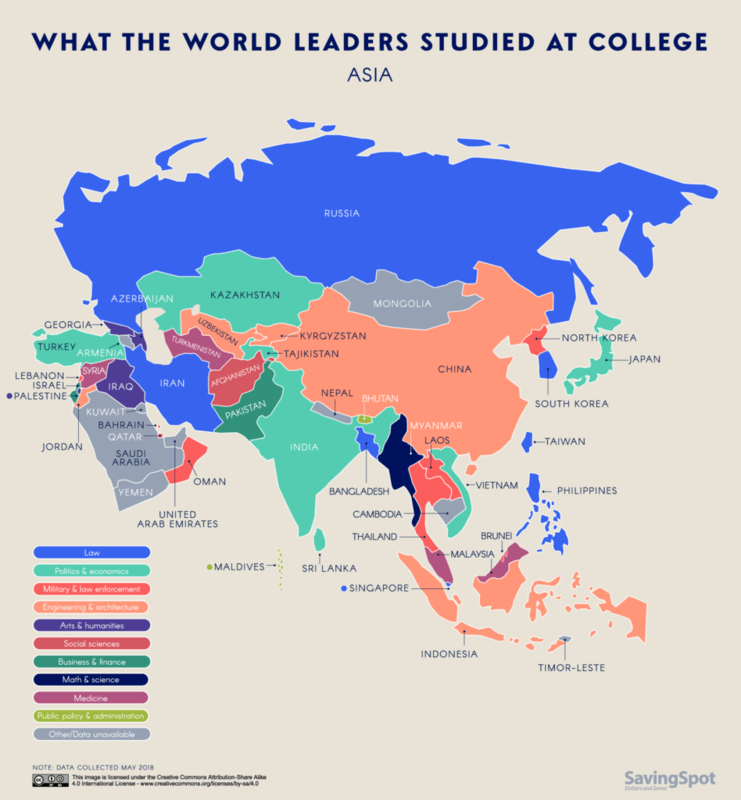 According to the research, 83% of the world’s rulers had some kind of post-secondary education, with the rest either receiving more practical experience or being spared the necessity of sharing a dorm because they were members of a Royal Family, like Saudi King Salman bin Abdulaziz Al-Saud. 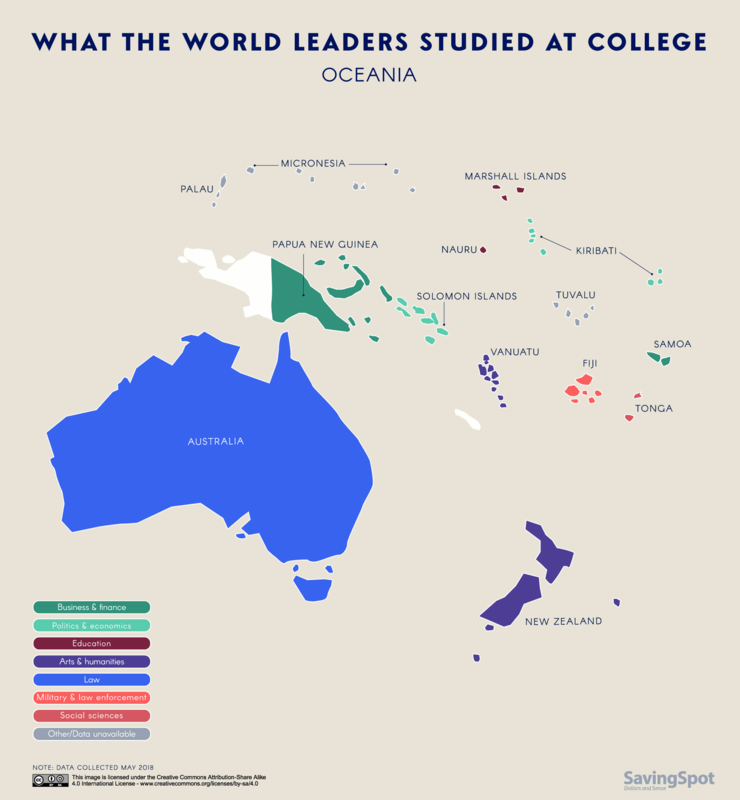 While college qualifications in politics, economics and law have been part of the path to power for a large number of the world’s top leaders, this research by SavingSpot shows that it’s far from universal. Even if you didn’t go to college at all or trained to be a welder or a zoologist, there’s more to becoming a world leader than what education you received.